Coffee is cultivated in the entire subtropical zone. The so-called coffee belt is between the 23° N latitude and the 25° S latitude. The coffee plant reacts sensitively to very strong wind and much heat. It does not bear frost at all. Positive conditions are a temperature which is constantly above 17 °C and soil that can store water well. As far as the harvest is concerned one distinguishes between the picking and the stripping method. The picking method guarantees a higher quality at a lower crop yield as the coffee cherries are picked individually. The pickers go, in intervals of a few days, through the plantation and only harvest the really ripe cherries. With this method, between 50 and 100kg are picked per day. The stripping method is cheaper but at the same time lower in quality than the picking method. All coffee cherries are picked at once and unripe and overripe cherries as well. The picked cherries are now unwrapped to bring out the beans. Here again one distinguishes between two methods, the so-called dry- and the wet method. With the dry method, the unwashed cherries are spread out on a large surface. They are constantly raked and turned for 3 to 4 weeks as they equally dry by the sun. The hulling then takes place with special machines. The result of this process is the raw coffee bean. With the wet method, the cherries are put into large tanks with flowing water. Via water-washing channels they are transported to the pulper which removes the pulp of the fruit. The silver skin is then removed from the macerated beans and dipped into water again. Finally the beans are separated and sorted. Before the beans go to their last and most important step of treatment they get on their journey to their target country. This normally happens by ship. Having arrived at the port of destination, they are mostly roasted on the spot to be able to guarantee the freshness of the coffee. 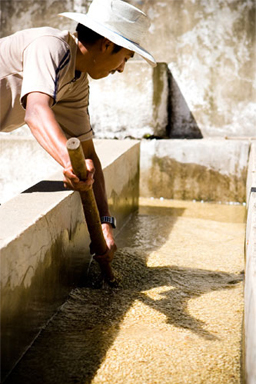 With the most important step of the coffee production  the roasting - coffee gets its flavour and its colour. The beans are roasted at a temperature of 200 °C to 250 °C. As far as the roasting is concerned, the quality depends a lot from time. Therefore, a long-time roasting lasts up to 25 minutes. Length and temperature depend on the coffee. Each coffee has its ideal roasting degree. 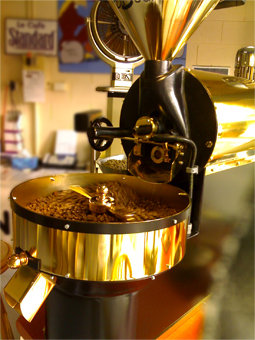 The beans are slowly burnished in a drum roaster, perfectly develop their flavours and incompatible acids are roasted. The industrial roasting time lasts less than 10minutes. With this process, which is very fast and very hot (temperatures up to 550 °C) the beans are not roasted sufficiently and equally. As a result they cannot develop any kind of specific aroma and also contain more chlorogenic acid and not all acids can be decomposed respectively. This can lead to cardialgia and stomach problems. The advantage of this procedure is, however, its efficiency because big charges are applied in comparison to the drum roasting. To conclude it is to say that coffee of a traditional drum roaster should have a better quality than industrial coffee. Light roast: pale or cinnamon roast. The beans have a very light cinnamon colour after the process of roasting. Medium roast: American roasting, breakfast roasting. The beans are light brown to chestnut-brown. Full roast: light French roast, Vienna roast. The beans are middle brown and are slightly shiny on their surface because of the emerging oil. Double roast: Continental roast, French Roast. The beans look dark brown and have a continuous oilskin coat. Italian roast: espresso roast. The beans are dark brown to black and have a large amount of oil on the surface. Torrefacto (Spanish for roasted) = roasting by adding a certain amount of sugar, especially common in Spain.